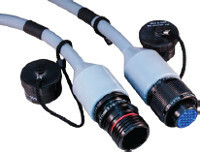 Most wire and cable specifiers have simple expectations, such as dielectric materials that don't break down over time — requiring expensive replacement long before the lifetime of the ship, plane of vehicle is reached.They also want jacket materials that can withstand high heat, extreme UV radiation, demanding weather conditions and caustic chemicals and fluids. Glenair Duralectric™ material delivers on these expectations — and a whole lot more. 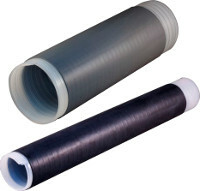 The dielectric material is a special formula with extremely-high durability. Duralectric™ weatherproof jacketing is halogen free, flame resistant, and functional to 260°C. Duralectric™ far surpasses the accelerated solar weathering standards under IEC 60068-2-5, and is tested to 56 accelerated days, equivalent to 53 years of solar exposure. Glenair can supply the material in a variety of formats, including blown jacketing, as an extrusion over wire and cable, as an overmolding compound and as a self-vulcanizing repair tape.